While the results I saw in the videos were great, I was still whatever about the program. I’ve seen tons of infomercials and they always show amazing before and after photos, so what made this program any different? Well, lucky for me my brother went ahead and bought it and when he received the package in the mail… I was impressed! So the whole point of this program is something called “Muscle Confusion” which “accelerates the results process by constantly introducing new moves and routines so your body never plateaus”. Now that is something I need. We have an elliptical trainer and treadmill at home but I feel like my body is used to it already and it’s been quite a while since I’ve seen any dramatic changes in my body. I’m afraid I have reached a plateau! So what this program does is introduce new moves and switches everything up just as your muscles start getting used to performing certain exercise movements. You get 12 DVDS: Chest & Back, Plyometrics, Shoulders & Arms, Yoga X, Legs & Back, Kenpo X, X Stretch, Core Synergistics, Chest Shoulders & Triceps, Back & Biceps, Cardio X and Ab Ripper X. And… OMG… each workout is at least 50 minutes long. I hear these videos work you out really hard. My brother actually just started the P90X Classic program on Monday… in fact he just walked into my room right now and his shirt is like 80% drenched in sweat. And keep in mind that my brother is already in good shape. What I absolutely love about the P90X fitness program is how detailed it is. I have ordered workout videos before, which I ended up being happy with, but they were in no way as detailed as the P90X training program. The P90X came with 2 books. BOOKS. 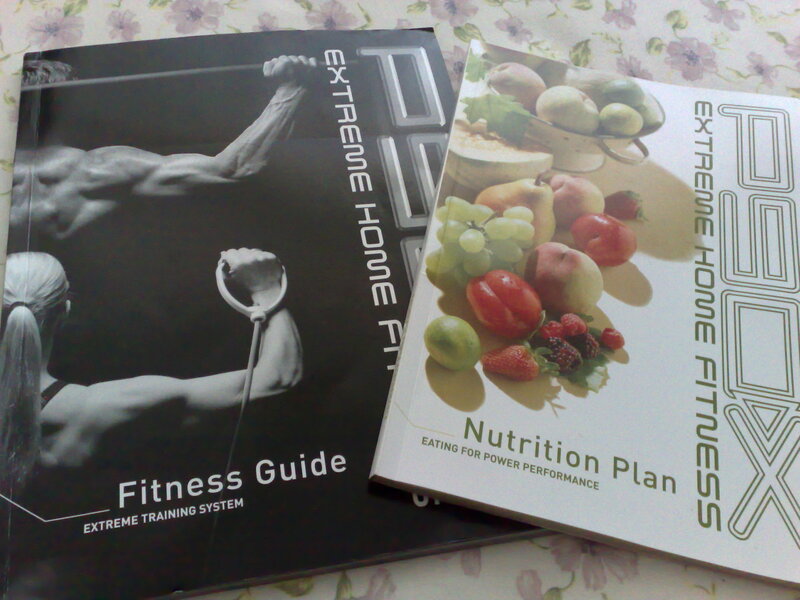 One is the P90X Fitness Guide and the other is the P90X 3-Phase Nutrition Plan. I compared these books to the typical 5×8 inch booklets with about 10 pages of information from other workout videos I have ordered before. Anyways, the Fitness Guide tells you all about the workouts, what you should have, what you should be able to do, what to expect, and what are your options. By options I mean that there are 3 different workout programs and you pick which one you would like to do for 90 days. My brother, and most guys I’m assuming, choose P90x Classic. I’m guessing it’s the original P90x and more intense with weights and strength. I, on the other hand, am going to do the P90x Lean program. This is “more cardio and less resistance for maximum weight loss”. I believe this is more popular for women like me! And finally there is P90x Doubles, which incorporates 2 different workouts in a day. Which I think is bananas, lol I’m kidding! Apparently this is the way to go for athletes who are about to start their season and what not and takes extreme dedication! Then the Nutrition Plan explains a healthy way to eat and details 3 specific phases to go through – Fat Shredder, Energy Booster, and Endurance Maximizer. Like the Fitness Guide, I love how the Nutrition Plan book is packed with information. Not only do they tell you what foods in general you should eat, but they give recipes and they even list foods that are okay to eat when you’re on the go and have to eat at fast food places or restaurants like Jack In The Box, Taco Bell, McDonald’s, Burger King, and more. I find the information they give to be very useful and very realistic. So there you go, that’s my little P90X introduction for you. I plan on starting the P90x Lean program next Monday. I hope I can keep it up since they want you to work out 6-7 days a week. It will be hard considering my schedule but I’ll do my best. I might post updates, who knows… so stay tuned! To check it out for yourself visit P90x’s official site at P90x.com. A burning question: what is the difference between a California Latina and a New York Latina??? Good luck on the workout plan! I’m happy that you “love how the Nutrition Plan book is packed with information”. In my experience, the Nutrition Plan lacked a lot of information and was contradictory in places (e.g. you’re supposed to drink 12oz of water 2h before the workout, but the workout is supposed to be the first thing in the morning… !?). As I found answers to my questions after a lot of research on the teambeachbody.com forums, I put up a pretty comprehensive P90X FAQ. thank you for share your storys. I cant wait to start went i get some moneys. I never think finding the great weight loss training online can be such a daunting thing until I did it by myself. Honest to goodness, I spent an entire week to come up with the conclusion about the great weight loss program currently available online. There’s nothing like being lean and healthy. In today’s world, we really need toworkout more often and throw off our unhealthy diet habits. It’s not difficult. You only need to stick to a workout program and keep going until you reach your objectives. It’s not always easy coming up with new content, but you really can do it well! Many thanks for putting this material up.This is just what Iâ€™ve been seeking.